At Thistle Initiatives we operate across the financial services market, covering sectors as diverse as fintech and general insurance. Our clients range from niche start-ups to the largest of distributors, including investment specialists, as well as insurers and capacity providers. Our team is divided into practice specialists so you can be sure of dealing with individuals who understand your market and the particular regulatory challenges your business faces. We advise and support firms in relation to compliance with FCA regulation, PRA requirements and key legislation impacting the financial services industry including GDPR and the Money Laundering Regulations 2017. The type of support we provide is as diverse as our client base. We assist firms with direct authorisation for new start-ups or transitioning from AR to DA status; provide advice on capital adequacy and regulated accounting including CASS; support firms to deal with Section 166 issues; provide training, locum compliance office services, audits, due diligence and much more as well as ongoing day to day support and advice, at the end of a phone or face to face. Thistle Initiatives was established by James Dingwall in 2012 with the aim of providing firms operating in the financial services sector with an expert compliance resource, capable of managing both strategic and hands-on projects across all regulatory areas. James’s experience with one of the big four consultancy firms gave him an excellent grounding in the challenges faced by firms in the financial services sector and the skills and experience needed to deliver solutions. Building on this blue-chip background, James’s philosophy is to keep the commitment to skills and expertise but to add a more personal and tailored approach so that the ‘Thistle way’ is a greater focus on interpreting regulations in order to provide practical solutions which deliver specific business solutions to clients. 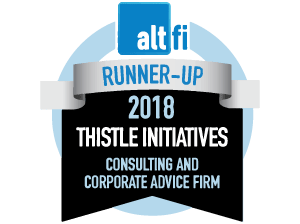 It is a philosophy which has delivered results both to our clients and to Thistle; continuous growth has led to Thistle becoming one of the UK’s leading regulatory consultancies. We currently have more than 70 talented people working in our team and have offices in London, Leeds, Warrington, Edinburgh and Dublin. Our client base includes many well-known names and we continue to grow and expand the range of services and support which we provide. Thistle Initiatives is one of the largest members of the Association of Professional Compliance Consultants (APCC), the body for compliance consultancies which advise firms regulated by the Financial Conduct Authority in the UK. The APCC is active in enhancing the professional standards of compliance consultants and sets professional standards and best practice guidance for its members to follow. The APCC is recognised as a trade body by the FCA and this relationship with the Regulator provides members such as Thistle with direct access to the FCA as the APCC often works in conjunction with the Regulator to pilot or test new initiatives and to give feedback on specific subjects as required.